Our Wenger instrument storage cabinets are the best-built, most reliable storage cabinets available. Heavy-duty hardware and top-quality doors, together with Wenger's patented polyethylene shelves, ensure reliable day-to-day operation and unparalleled durability when you buy Wenger storage cabinets. Our cabinets are also designed to look great with virtually any decor. They're available in a range of sizes, colours and styles to fit a wide variety of needs. That includes different door types for different applications. Plus, our cabinets are modular so you can rearrange and even add units as needed. 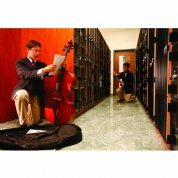 We also offer instrument storage racks including cello racks, violin/viola racks and string bass racks, to store, protect and transport your valuable stringed instruments. 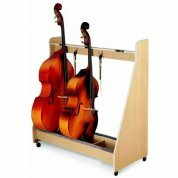 The stable design keeps your cellos, violins/violas and string basses safe during storage and transport, and the smooth-rolling caddy lets you roll them anywhere without worrying about bumps, nicks or scratches. 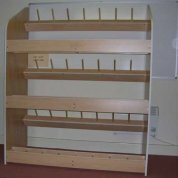 Plus, the racks store flush in a compact footprint. 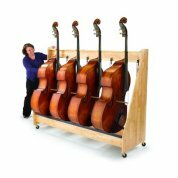 The wooden instrument racks are environmentally friendly - made from renewable forest resources. The Wenger AcoustiCabinets are a way to minimise the loss of cubic volume, provide sound absorption, and help eliminate flutter echo caused by direct sound reflection. After working closely with acoustic consultants, Wenger has developed an instrument storage cabinet that combines specially designed grille doors, acoustically absorptive material and reliable durability to produce storage that can help enhance the room's acoustic performance. The unique curved grille door design provides a distinctive look, minimises a room's cubic volume loss and reduces vibration. The environmentally-friendly material at the back of the AcoustiCabinet helps eliminate direct sound reflection while absorbint high and low frequencies. You can add number cards to your AcoustiCabinets and lock them with standard combination locks just like traditional Wenger cabinets (locks not included). Like all Wenger cabinets, AcoustiCabinets are built with the same heavy-duty construction for maximum performance and durability. 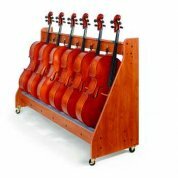 Strings are beautiful, elegant, expensive - and also very fragile, so our Stringed Instrument Racks will take great care of your valuable instruments. The stable design keeps strings safe during storage and transport, and the smooth-rolling caddy lets you roll them anywhere without worrying about bumps, nicks or scratches. 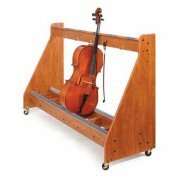 Solid, space-saving protection for your most fragile instruments, stores violins and violas in their cases. 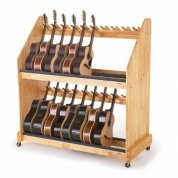 Wenger mobile guitar storage rack. 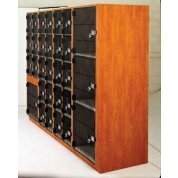 AcoustiCabinets are the storage solution that helps enhance a room's acoustical performance! 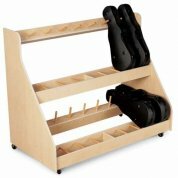 Gearboss shelving is an affordable, flexible and durable storage solution. 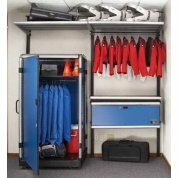 The Wenger UltraStor instrument storage cabinets with patented polyethylene shelves are the best-built, most-reliable storage cabinets available.